Designed for 25 x 25 mm package size, Model GT-BGA-2019 operates at bandwidths up to 75 GHz with less than 1 dB of insertion loss. Socket is designed to dissipate 7 W using compression screw with heat sink fins and can be customized up to 100 W with modified fin design on top of screw and adding axial flow fan. Constructed with low inductance elastomer contactor, socket features typical contact resistance of 30 mΩ per pin and is mounted on target PCB with no soldering. EAGAN, MN – Ironwood Electronics has recently introduced a new BGA socket design using high performance elastomer capable of 75GHz, very low inductance and wide temperature applications. 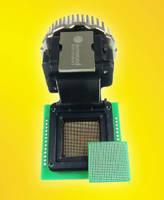 The GT-BGA-2019 socket is designed for 25x25 mm package size and operates at bandwidths up to 75GHz with less than 1dB of insertion loss. The socket is designed to dissipate 7 watts using compression screw with heat sink fins and can be customized up to 100 watts with modified fin design on top of the screw and adding axial flow fan. The contact resistance is typically 30 milliohms per pin. The socket is mounted on the target PCB with no soldering, and uses very small real estate allowing capacitors/resistors to be placed close by. Other passive components can be placed on the back side of PCB by creating custom cutouts in the stiffener plate. The socket is constructed with clamshell lid which incorporates a quick insertion method so that IC’s can be changed out quickly. To use, place the device inside the socket, close the lid by latching and apply downward pressure by turning heat sink compression screw. The GT-BGA-2019 socket is constructed with high performance and low inductance elastomer contactor. The temperature range is -55 C to +160 C. Works with IC's such as BGA, 25x25mm with 24x24 array and 1mm pitch. Pricing for the GT-BGA-2019 is $909 at qty 1; with reduced pricing available depending on quantity required.